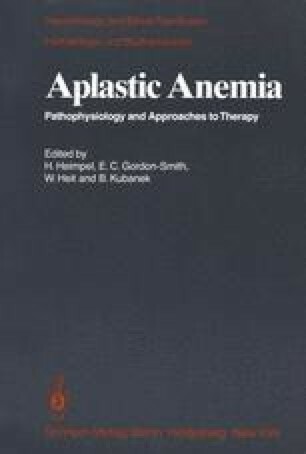 Aplastic anemia is a syndrome characterized by marrow hypoplasia and severe pancytopenia. While most cases of aplastic anemia have been attributed to congenital or acquired stem cell defects, it seems likely that several diseases of different etiology and pathogenesis exist. The availability of in vitro techniques for detection of myeloid and erythroid progenitor cells has provided an experimental approach for determining the mechanisms leading to aplastic anemia. Using these systems, evidence has been obtained for a reversible immunologically-mediated suppression of hematopoiesis in certain cases of aplastic anemia [1, 8]. In these studies, the severe defect in myeloid colony formation in vitro was corrected by removal of small lymphocytes from the patients’ marrow by velocity sedimentation or treatment with anti-thymocyte globulin and complement. These candidate suppressor cells were also identified by their ability to inhibit normal CFU-c when marrow from the patient was co-cultured with marrow from a normal donor in the CFU-c assay. These preliminary studies on immunologic mechanisms leading to aplasia have been confirmed by others [5, 6] and extended to a demonstration of suppression of erythroid colony formation by aplastic peripheral blood mononuclear cells.